From the bestselling author of Oracle Bones and River Town comes the final book in his award-winning trilogy on the human side of the economic revolution in China. Peter Hessler, whom the Wall Street Journal calls "one of the Western world's most thoughtful writers on modern China," deftly illuminates the vast, shifting landscape of a traditionally rural nation that, having once built walls against foreigners, is now building roads and factory towns that look to the outside world. Peter Hessler is a staff writer at The New Yorker, where he served as the Beijing correspondent from 2000 to 2007, and is also a contributing writer for National Geographic. He is the author of River Town, which won the Kiriyama Prize; Oracle Bones, which was a finalist for the National Book Award; and, most recently, Country Driving. He won the 2008 National Magazine Award for excellence in reporting, and he was named a MacArthur Fellow in 2011. He lives in Cairo. “Exceptionally moving. . . . 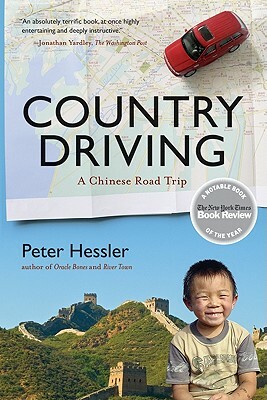 Hilarious. . . . An absolutely terrific book, at once highly entertaining and deeply instructive. . . . Country Driving is a wonderful book about China that also happens to be a terrific book about the human race.